When they are healthy and well adjusted to captivity, fish eat at a regular time and become accustomed to the spot where the food is given out. It is advisable to divide the daily ration into two parts - one in the morning and one in the evening, for example. The end of the day - 1 or 2 hours before turning the aquarium lighting off - is usually the most practical for the aquarist. In any event, food distribution offers a special opportunity to observe the behavior of your residents and check their state of health. Allowing the fish to come and feed out of your hand is particularly enjoyable, but take care, because some large specimens have impressive teeth! 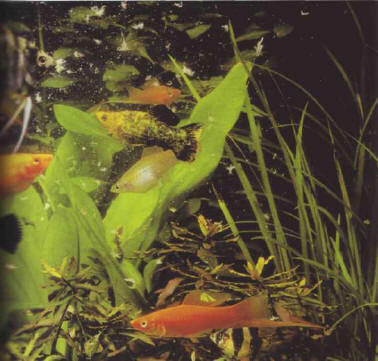 If the water is too agitated, artificial or natural food may be dispersed too quickly and washed to a corner of the aquarium where the fish will not be able to recover it. thereby creating a potential for pollution. The stirring of the water must therefore cease when food is being distributed and eaten. When they are born, the fry of egg-laying fish feed on the reserves in their vitellin vesicle, as their mouth does not open until a few days later. They will then often accept the fine powders which are available commercially. If this is not the case. give them brine shrimp nauplii for a few days - newly hatched nauplii are most suitable for the first two days. After that, they can be offered nauplii that are 48 hours old. Daily production over a period of several days must therefore be planned for. If brine shrimps are unavailable, another option is the production of infusorians. 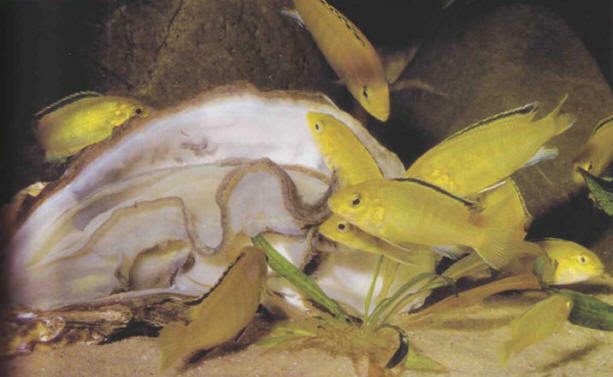 Live-bearing fish (the Poeciliid family) accept artificial food from birth, and they also thrive on brine shrimp nauplii. As for marine fish, rotifers, discussed above, should be used, as they easily fit into the small mouths of the fry. The dry eggs (known as cysts) are available in aquarium supply stores. They must be kept away from light and moisture. In order to make them hatch, salt water must be prepared with the following characteristics: temperature 25°C, salinity 35%, i.e. a specific gravity of 1.023. 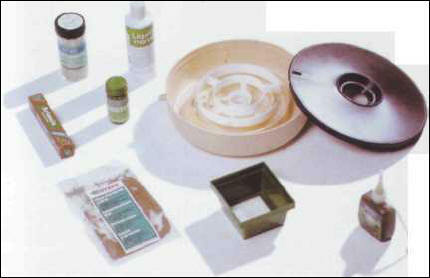 Equipment available in aquarium stores for hatching brine shrimps. The salt water can be natural or reconstituted with special aquarium salts, or even with rough kitchen salt (easier for aquarists who do not keep marine fish). 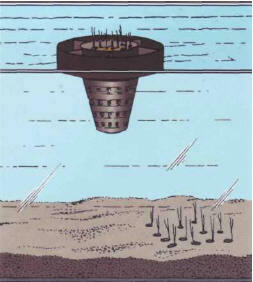 The water can be colder and less salty (up to 20°C and 20%, i.e. a specific gravity of 1.014), but the hatching rate will be lower (50-60% against 80-90%). Any small glass or PVC container can be used - bottles, for example - although specialist equipment is available. The eggs are placed in the still water for a quarter of an hour, the time required for their rehydration. If we estimate that 250,000 eggs weigh around 1 g, a tiny amount (the tip of a knife, for example) will produce sufficient brine shrimps. Aerate the water slightly to produce small bubbles, which will disperse the eggs, but be careful not to stir the water too vigorously, otherwise some of the eggs will crash against the sides of the container and will not hatch. The hatching occurs after 24-36 hours at 25°C, or after up to 48 hours at 20°C. Finally, switch off the aeration: the empty shells will float to the surface, the unhatched eggs will fall to the bottom, and the brine shrimp nauplii will be swimming just under the surface. It is then easy to siphon them off (with an aeration pipe, for example) and strain them through a small filter (available commercially), or, alternatively, through the thin mesh of a piece of old curtain, or even a very fine pantyhose. To make this operation easier, you can group the nauplii together using a flashlight, as they are attracted by light. You can then go on to feed them to the fry. They will only survive for a few minutes outside salted water, and they will not eat on the first day after hatching. If you want to keep them for several days to obtain larger or more mature larvae, special food is commercially available. This makes it possible to keep brine shrimps until they are adults. Hatching brine shrimp eggs in gently stirred water. 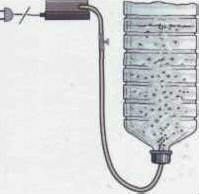 A Collecting brine shrimp nauplii through siphoning. Adult brine shrimps are sold live in small sealed sachets containing salt water and air. They are passed through a sieve before being given to the fish, which enjoy hunting them down. They survive for a few minutes in unsalted water. Brine shrimps can also be bought frozen. When feeding, it is important to avoid any overdosing, whether with artificial food or live prey, such as the adult brine shrimps pictured here. 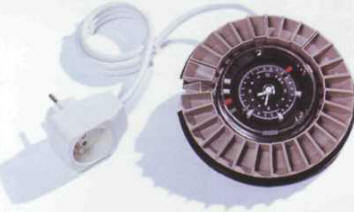 Automatic food distributor for artificial food. Each section corresponds to a daily dose. These are microscopic, unicellular animals, easy to produce in fresh water. They are usually present in small numbers in an aquarium. Riccia, a surface plant, gives them a chance to grow, as they find food (organicmatter) on its leaves. They can also be produced by leaving a piece of potato, a lettuce leaf, or some paddy rice (unhusked rice, available in grain stores) to soak in a receptacle containing aquarium water. What if a fish does not eat? Sometimes a fish refuses to eat, or appears to be incapable of doing so. It is therefore a question of finding the cause and eliminating it. A newcomer to a tank rarely eats on the first day. This is normal, as it feels lost in its new environment. Small species and more lethargic fish are often dominated by their bigger and faster cohabitants at feeding time. They must therefore always be fed separately, preferably with mobile, live prey, once the other fish have been distracted by other food. In captivity, the fry can be fed with brine shrimp nauplii and then with fine commercial powders. A fish can also refuse to eat if it is sick, and this will be reflected in its behavior, color, and other symptoms which may eventually be seen on its body. In this situation it must be isolated in another aquarium, treated, and given rich food comprised of live prey or fresh produce. Sometimes fish can systematically refuse to eat artificial food, although this is rare in fresh water, but less so in marine aquariums. There is no point in being stubborn: change to a varied diet based on live prey and homemade fare. Paddy rice can be used to produce infusorians. It is "sown" on the bed or placed in a tubifex worm "feeder". give them a little, but often. Two portions a day is ideal. 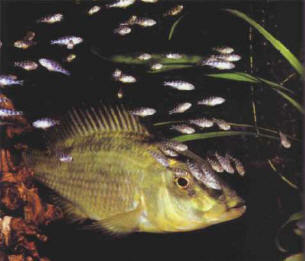 For fry, the feeding can be more frequent. 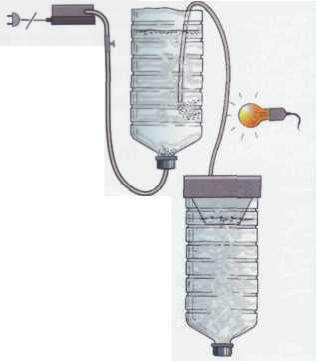 siphon off any food surplus as quickly as possible, as the leftovers are pollutants. 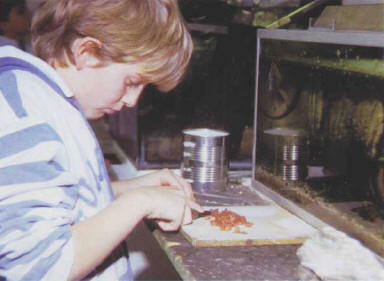 Preparing defrosted food before feeding it to large fish. A hard-boiled egg yolk is added to water in a glass. This forms microparticles which are then sieved. Some aquarists use oysters to nourish their fish, which seem to enjoy them. This nutritious liquid is then given to the fry, taking care not to put too much into the tank, as it is always important to minimize pollution. Egg yolk, rich in proteins and lipids, can be used as a complement or as a replacement for other food. ХАНДЖЯН Агаси Гевондович (1901-36) , политический деятель. С 1928 2-й, с 1930 1-й секретарь ЦК КП(б) Армении. Репрессирован; реабилитирован посмертно.